The built-in Developer Tools are particularly helpful when building and debugging web pages. Open a web page or a web app and select Tools > Developer Tools from the menu. Open a web page or a web app and right-click on any page element and select Inspect Element from the context menu. Use the F12 / ⇧⌘I shortcut to quickly open the Developer Tools. 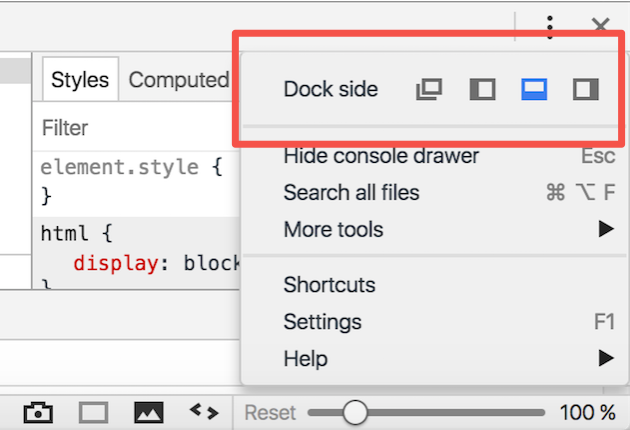 After you have opened Developer Tools, click the vertical ellipsis button ( ⋮ ) and choose a docking option.